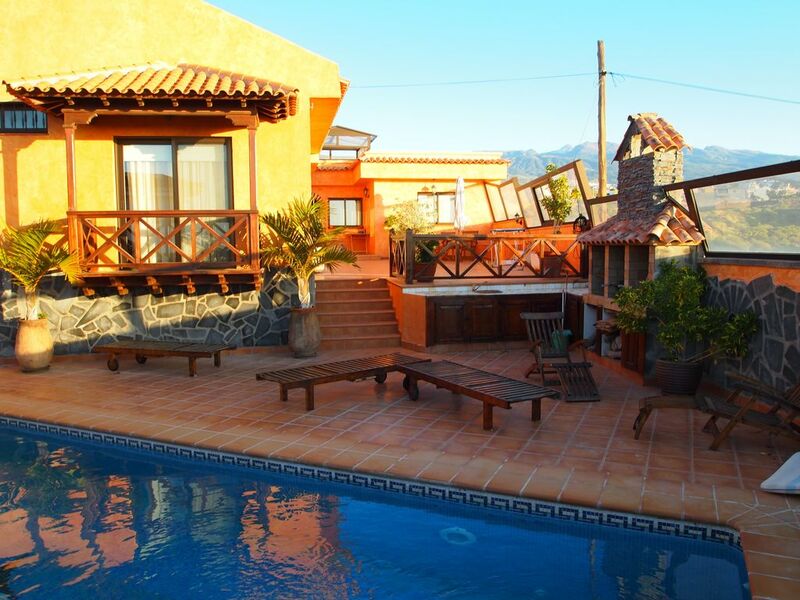 Spectacular home colonial style near of Tenerife South Airport. Very close to the main turistic zones like 'Los Cristianos beach ', Adeje Coast and 'Las Americas '. At the same time is a house very quiet, with very beautiful and fragrant garden, big swimming pool and big barbecue. Has 3 bedrooms ( with 3 bathrooms, and one of them also with dressing room ) big kitchen, 2 big terraces , indonesian wood porch, living room, dining room, little office and garage. Also inside the property there is a little apartment annex to the house with 2 bedrooms, 1 bathroom, kitchen and another garage. A beautiful house with lovely distant views to the sea, plenty of space to sit on the pool terrace or in the garden. Also plenty of shade inside and out when needed. The house does have a few small problems but none that detracted from our overall enjoyment. Good communication from both the owner and house manager. Great location close to the airport and motorway (but not noisy). If you go with the right attitude you will not be disappointed. Would thoroughly recommend to anyone. Ignore the earlier negative reviews - if you want perfection go to the Burj Al Arab. The house itself is big and spacious, has adequate amount of cutlery, pots and pans etc, big TV, nice rooms. Everything would be great if only owners looked after the house and provided some service. When we moved in the guy didn't bother to explain any facilities in the house. It seemed that we bothered him. We had some troubles with checking in so at least we got a lift to the shop near by. Thanks for that but that was the only positive customer service experience. Straight after checking in we reported some lights not working as well as internet. The guy rushed away saying that he would come next morning to fix everything. Fair enough - it was rather late. Bedsheets were filthy - lots of hair. We had to wash everything in washing machine. The next day the guy came back restarted the rooter and said it would work fine and left. No light bulbs were replaced. When we started cooking it turned out that hot plate and oven can't be used simultaneously. It blowed up the fuses. It took us a while to find a fuse box (it would be easier if that would be explained at check in time). Swimming pool hasn't been cleaned in months and water extremely cold. You could barely spend there 2 seconds. The kettle was out of order so we boiled water for tea in pots. Some hinges are literally falling off. We also found a coffee maker in the cupboard full of mold. You could easily forget that all if only some effort would be made to fix the things or at least some apologies provided. When we reported internet not working for a second time and also state of swimming pool. There was no answer. We had to call from the different number to get through. That was already 3rd day. The answer was with a very rude tone : "I am busy at work so can't come before the evening." As we all were away for a day someone managed to fix internet in the meantime. Thank you for that but that means that 3 days out of 4 we had no internet. Pool stayed the same as well as all the other things, so we just gave up. On a check out guy gave us cold shoulder. It was clear that he would rather be somewhere else. House itself is located in quiet residential area. Nearest supermarket is about half an hour walk and if you want to go to the beach taxi would cost you around 25 EUR. If you decide to stay at this home make sure you bring your own tools and light bulbs, your mobile internet works fine and don't expect pool, clean linen or any service. Fix the service part and it will make 4 stars. El cliente tiene razon en algunas cosas que ya se han solventado: Internet hemos cambiado de compañia por otra más fiable y ahora funciona correctamente. Todas las casas tiene un limitador de potencia, si se conectan a la vez cocina, horno, luces aire acondicionado y motor de la piscina, es lógico que salte el limitador, se solventa usando menos potencia. La piscina fria en el mes de Enero, es lo lógico, el servicio de calentamiento de piscina se ofrece aparte del precio. En cuanto a las bombillas, todas las partes de la casa están iluminadas, algunas habitaciones la lampara tiene tres bombillas mas las de la mesita, si alguna falla la habitación tiene luz de sobra y no es necesario poner más, en cuanto a la limpieza solo hubiera bastado decirselo al encargado para cambiar las sabanas, si no lo hizo no pueden ahora decirlo aquí. This house could have been perfect, it has great potential. Unfortunately, the lack of maintenance makes the house only average rating. Equipment in the kitchen hassles, dishwasher, fridge, coffee maker, lamps and drawers. Wir waren mit 9 Personen in diesem Ferienhaus. Es ist zentral gelegen. Einkaufsmöglichkeiten in der Nähe. Auto wird aber jedoch benöltigt. Das Haus ist jedoch mal renovierungsbedürftig. Es war alles sauber und recht einfach gehalten. In der Küche muss man etwas Einfallsreich sein. Da sollte mal wieder etwas an Geschirr und Küchenutensilien investiert werden. Die Erwartungen darf man nicht zu hoch schrauben. Verständigung mit der ersten Kontaktperson auf Englisch. Der zweite nur Spanisch. Aber es gibt ja Goggelübersetzer. Im großen und ganzen hat es uns allen sehr gut gefallen. Nous avons passé un bon séjour. Maison spacieuse et confortable pour 10 personnes. Piscine un peu fraîche pour la saison (fin octobre). Bien situé, Commerces, plages, et visites. Propriétaire disponible. El precio por noche mostrado de nuestra propiedad está basado en 4 personas. Cada persona extra se contará a 10€ por persona y por noche. Reserva de la casa: 500 €. El resto del importe se abonara 1 mes antes del día dellegada. Depósito de roturas: 300 €. Dicho depósito se paga en el momento de la entrada y se retorna el día de la salida.